USING UNMANNED HELICOPTERS FOR THERMAL IMAGING - тема научной статьи по космическим исследованиям из журнала "Исследование Земли из космоса"
The constantly increasing requirements for environment protection and disaster management call for implementation of modern technical facilities and technologies for monitoring that would allow gathering of the needed information in real-time. An innovative approach in this regard is the implementation of unmanned aerial vehicles (UAV) for discovery, observation and assessment of natural disasters, technological accidents, air pollution, security and control of the energy transportation infrastructure, etc. The current article offers a novel approach for utilization of unmanned helicopters for remote sensing research and surveillance in the field of thermal imaging that offers better signal to noise ratio in the gathered images. Due to fast development of microprocessor technologies, the invention of efficient batteries with high energy density and the introduction of modern magnets in brushless direct current motors, in the past few years it became possible for researchers to use small sized unmanned aerial vehicles in their studies. The most ubiquitous unmanned helicopters are the multi-rotor helicopter with four rotors (Hull, 2010; Pounds et al., 2006). This kind of helicopters are reliable and low priced, hence they are preferred vehicles when one needs to implement a multitude of helicopters working synchronously (Nigam, Kroo, 2008; Ni-gam, 2013). Remote sensing methods are a good candidate for unmanned four-rotor helicopters implementation, because satellites offer lower thermal image quality, due to higher altitude. Further, satellites fly over the studied area in a certain moment of time and when thermal imaging is in question it is important for the researcher to choose the exact day and hour to take the photographs. On the other hand, when engaging piloted aircraft the price is high, flight permission is required and again an exact hour of flight is hard to attain. 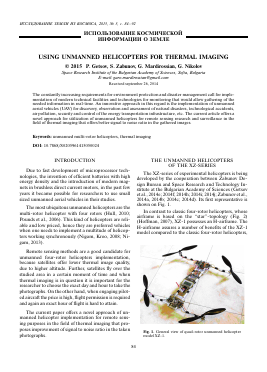 The current paper offers a novel approach of unmanned helicopter implementation for remote sensing purposes in the field of thermal imaging that proposes improvement of signal to noise ratio in the taken photographs. The XZ-series of experimental helicopters is being developed by the cooperation between Zabunov Design Bureau and Space Research and Technology Institute at the Bulgarian Academy of Sciences (Getsov et al., 2014e; 2014f; 2014h; 2014i; 2014j; Zabunov et al., 2014a, 2014b; 2014c; 2014d). Its first representative is shown on Fig. 1. Fig. 1. General view of quad-rotor unmanned helicopter model XZ-1. which motivated the leading designer of the XZ-series to choose exactly this airframe in his development. To support the choice of the H-airframe authors give a short description of the benefits of the H-topol-ogy when compared to the classic "star"-structure. 3)	The moments of inertia along the pitch and yaw axes are increased thus making the helicopter more stable. Another advantage of the H-airframe is observed when the user needs to mount a camera for piloted observation, the so called first person view camera (FPV camera). The camera may be attached to the fuselage at one of its ends thus avoiding propellers from shadowing the camera view (see Fig. 3). Fig. 2. Classic airframe structure of a quad-rotor unmanned helicopter. Fig. 3. Helicopter XZ-1 and mounting first person view camera. Fig. 4. Microbolometer based camera MIRICLE. objects on Earth surface or underneath it posses specific optical features in the infrared spectrum. Fig. 5. Infrared radiation absorption by atmosphere. tively small temperature contrasts against the background, depending on natural conditions and the time of the day. In the second group fall objects and phenomena having significantly higher own temperature — volcanoes, forest fires, geothermal waters, etc. Infrared spectrum is generally divided into four regions: near-infrared region (NIR) — from 0.7 to 1.0 ^m; short-wave infrared region (SWIR) — from 1.0 to 3.0 ^m, mid-wave infrared (MWIR) region — from 3.0 to 5.6 ^m and long-wave infrared (LWIR) region — from 8.0 to 14.0 ^m. Each region is specific in the information it carries and is used for different purposes. In the near infrared region one can obtain high quality data for cartography and complex geographic studies. Through images in this region one could successfully follow shore line and assess ice situation. When passing through atmosphere the infrared light is absorbed by the large molecules and water vapour (see Fig. 5). flying at lower altitudes ranging from several tens of meters to several hundred meters. The major parameters of the registering systems in the infrared spectrum depend mainly on the qualities of the infrared receiver. Currently there are two types of sensors — heat sensors and photon sensors. The heat sensors work by sensing the temperature change due to infrared radiation heating a thermo sensitive element — bolometer, thermistor, etc. The photon sensors are based on the phenomena internal and external photo effect occurring as a result of the direct interaction of photons with charge carriers in the material of the sensitive element. In most thermal cameras the sensitive element is placed in a cryogenic cooler thus increasing the sensitivity of the sensor. The cryogenic module significantly complicates the construction, increases the weight, dimensions and energy consumption of these cameras. For this reason non-cooled thermal cameras are developed using microbolometer sensors (see Figs. 4, 6, 7). Some of the current technologies for heat sensors of thermal cameras are shown in Table 1 (Freeman et al., 2000; Kubiak et al., 2003; Nguyen et al., 2003; Soo et al., 2000). Fig. б. Microbolometer based camera MicroCam 2. Infrarroja, Thermoteknix, Thermal Wave Imaging, WuHan Guide Electronic Industrial Co., Ltd., XenIcs and so on. CAULFIELD H.J., FU J. — 2007 г.
ВАЛИЕВ А.В., ДОБРОВОЛЬСКИЙ Ю.А., КАНТЕМИРОВ Д.В., ЛЕВЧЕНКО А.В., ПАВЛОВ В.И., СЕЛИВАНОВ О.Д. — 2013 г.
ГРИШИН А.А., ИВАНОВА И.А., МОРОЗОВА Т.Ю., НИКОНОВ В.В. — 2015 г.
АНИСИМОВ АЛЕКСЕЙ НИКОЛАЕВИЧ, ПАНОВ ВИКТОР ВЛАДИМИРОВИЧ, ПЕТРАШКО ОЛЕГ ИГОРЕВИЧ — 2015 г.